The only place on earth where your driver opens the window to warm you up! Waking up full of cold, our flight being delayed and knowing we still had a 16-hour flight ahead of us could not dampen our spirits for this once-in-a-lifetime trip. Within moments of landing in Bali I knew that I did not want to go home! The photos, and even this blog, will never ever be able to do such a beautiful place justice. Our driver from the hotel was awaiting our arrival. After collecting our luggage and going through the various checks we were finally on our way to our first villa in Seminyak. Upon arrival at Bali Nyuh Gading Villas we were greeted with a very welcome glass of fresh orange juice and a cold towel. After checking in and being escorted to our home for the next four nights there was only one thing for it in 29 degrees. Our bags were dumped and we dived straight into our private pool! After a few hours catching the last of the day’s rays we were ready to crash and burn after being awake for over 36 hours. 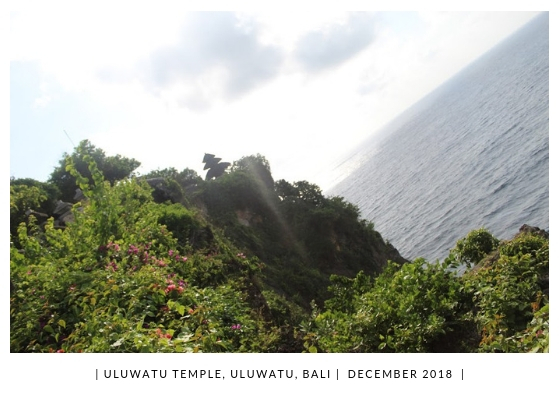 The excitement had finally worn off and an early night was on the cards so we could be ready to fully embrace Bali and everything this little piece of paradise had to offer us. Getting picked up at 8.30am gave us our first experience of rush hour traffic in Bali and it wasn’t for the faint-hearted. We arrived at the first waterfall - Tukad Cepung - around 10am and started the short walk down to the waterfall itself. We were fortunate that the few tourists there were leaving as we arrived so we had the place to ourselves. As the temperatures continued to steadily rise the walk back to the car was harder than anticipated due to the dense jungle and the number of steps. The fact that Agus our driver had broken out in a sweat made us feel that little bit better! Agus quickly achieved a legendary status as he unveiled a cool box full of water and coke waiting for us. 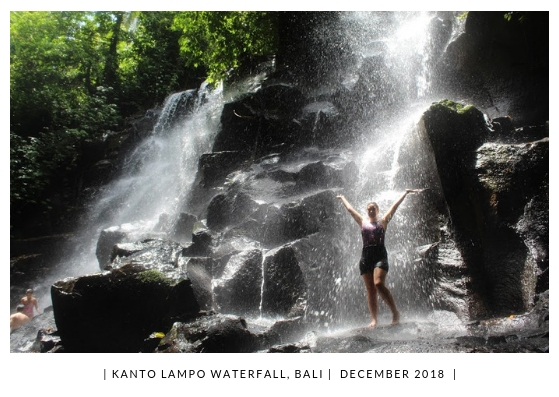 Next stop was Tibumana waterfall, however, we decided to trust Agus’s local knowledge and visited Kanto Lampo and we certainly weren’t disappointed. The last few steps to get down to the waterfall were a little tricky as it was slippy rocks and a wobbly handrail (be careful!) This was more popular than Tukad Cepung and we had to wait our turn for photos. My camera was held captive as our camera man decided to direct us for the ‘best shots’, these photos have been buried deep into my camera roll and will never see the light of day. All I shall say on the matter is … I was definitely not born to be a model! After convincing him we definitely did not need any more photos, we tackled the slippy rocks back to the top and headed back to the car. 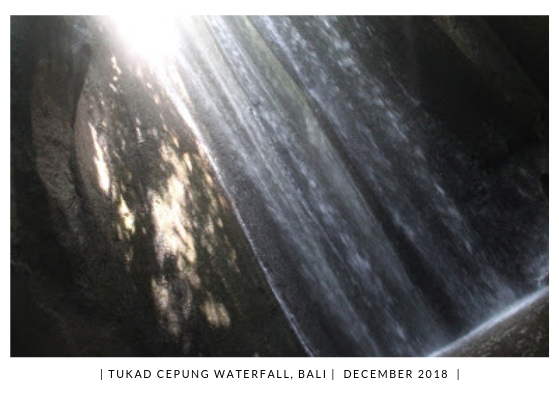 Our final waterfall was Tegenungan, after a stop for a traditional Balinese lunch, where we sat in 31 degree heat watching our friends de-icing their cars on Snapchat and feeling smug! After lunch we travelled the short distance to Tegenungan Waterfall which is by far the touristiest waterfall we visited and overall in Bali. I’d recommend going to say you have been - and you can also swim in the pool - but it was not the prettiest of the three. Walking down to the mountain of steps the street was lined with clothing stalls (so take extra money). Down near the waterfall are little cafes for refreshments and on the other side there are swings for those perfect shots. There are plenty of photo opportunities along the way. Day 2 saw us being driven by Wayan on our Ubud Hot Springs Private Tour. 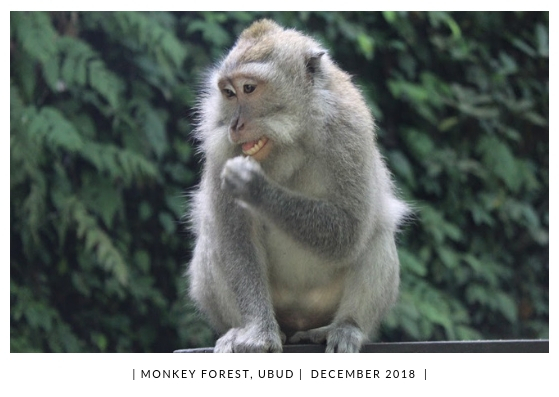 This included the Monkey Forest, Hot Spring, Rice Terrace, and Batuan Temple. We had roughly an hour at the Monkey Forest and were given strict instructions not to touch or make eye contact with them. We had enough time to walk around the forest but would definitely recommend staying longer if you can. 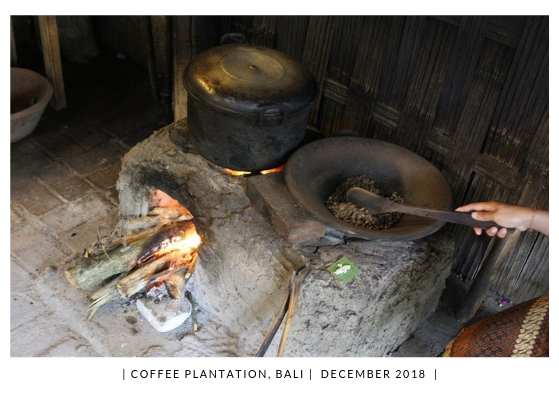 We then visited a coffee plantation and the rice terraces on the way to lunch at another traditional Balinese buffet restaurant with views of Mount Batur and Agung - Bali’s two active volcanoes. After lunch we headed down to the base of Mount Batur, driving through the lava rocks from the last serious explosion 55 years ago. 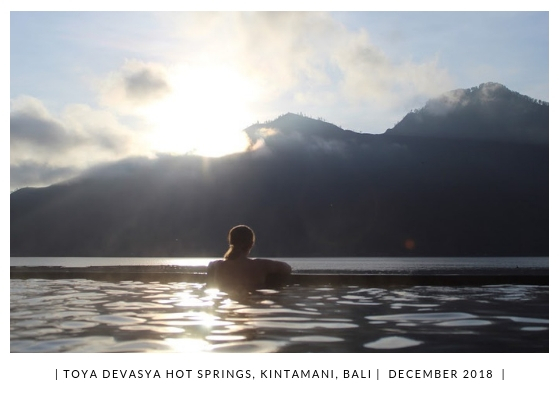 We arrived at the hot springs where the panoramic views of Mount Agung were out of this world. I didn’t think they could be any better until we visited the next day shortly after sunrise. 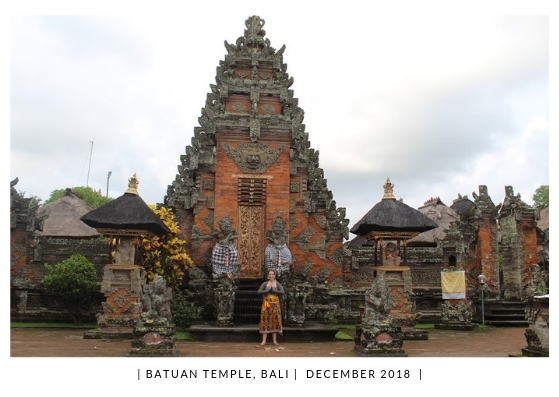 On our way back home we visited Batuan Temple and Wayan showed us around explaining the Hindu religion and the significance of the different altars and entrances to the temple. On Day 4 it was time to say goodbye to Seminyak and head south to Nusa Dua. Our villa arranged for a driver to take us from Seminyak to Nusa Dua for our remaining four nights. 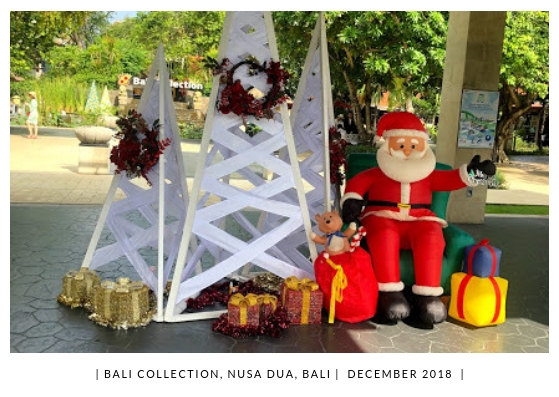 On route we visited the Bali Collection, a shopping mall full of quirky little boutiques and big brands, before checking in to our next villa. The remainder of the day was spent basking in the glorious 31 degree sun. Day 5 was for testing out the infamous Bali beaches! 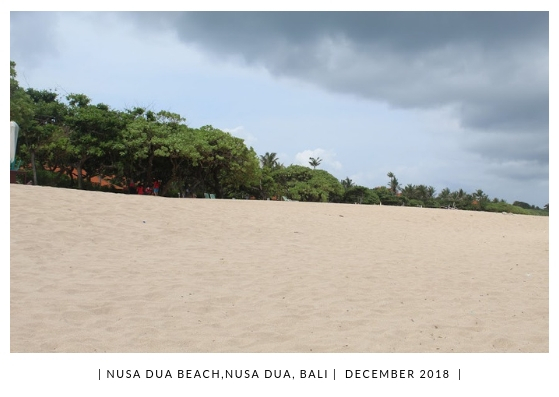 After breakfast we headed to Nusa Dua beach. The beach was quiet, albeit a little windy, and we definitely caught the sun due to this! After a few hours sunbathing and a cooling dip in the sea we headed along the beach front and grabbed a spot of lunch at one of the beach bars before heading back to the villa. 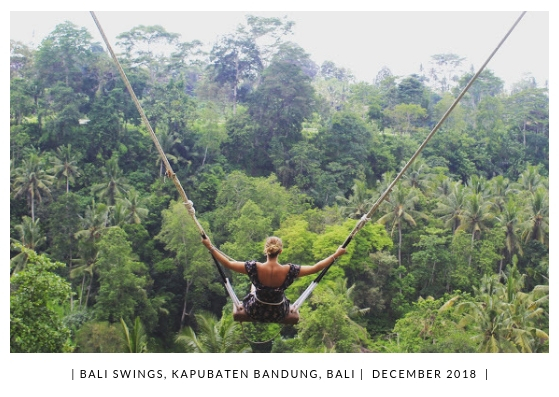 We swung our way through Day 6 at the Bali Swings. Bali Swings has a total of 13 swings, however, we only had access to four in our package - which for someone with a fear of heights is more than enough! 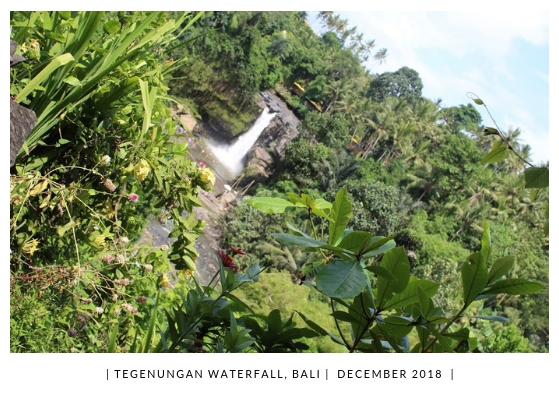 We also noticed when exploring that there are loads of other venues that have swings with amazing views such as Tegenungan Waterfall and the coffee plantation we visited. The prices aren’t included in your tickets so if you want to do one make sure you take extra money with you. We were also told that in Nusa Dua down on the beach there are also swings in the water, however, we didn’t have time to check these out. 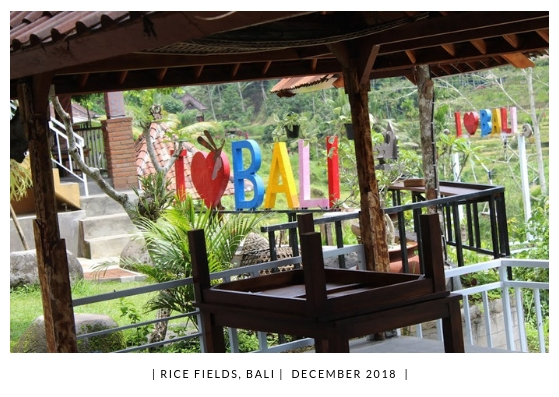 There are plenty of swings to take those jaw dropping Instagram pictures throughout Bali though, so it may be worthwhile doing a little bit of research to find your dream backdrop! 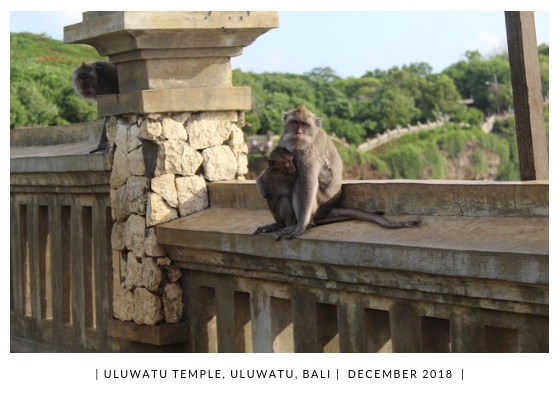 Winding down our adventure in Bali we visited Uluwatu Temple, which boasts spectacular views of the Indian Ocean - make sure you watch out for the monkeys! 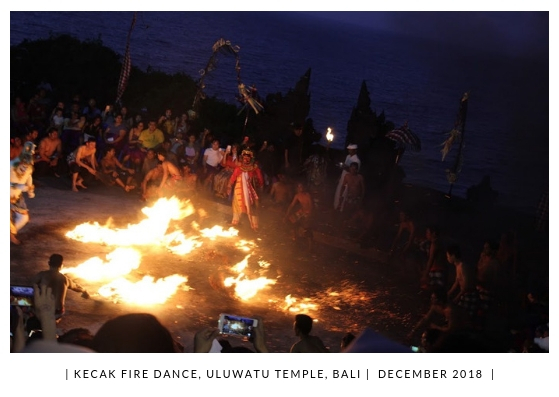 Our last night in Bali saw us taking in a traditional Kecak Dance that took place at sunset near the temple. I'd recommend getting there early to secure the best seats (we went for the middle and then half way up). Try to stay away from the bottom seats to the right (looking out to the sea) as the white monkey ends up kicking the fire and you definitely don't want to be caught in the cross fire as he tries to evade capture! 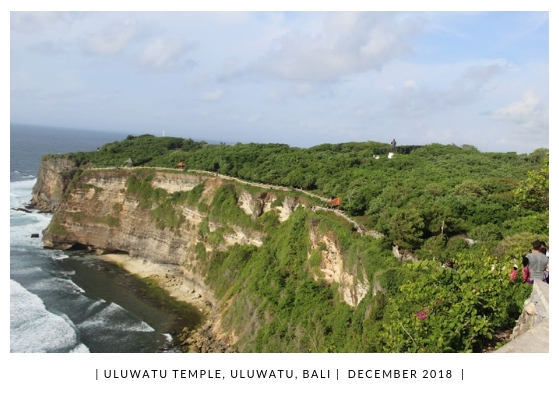 Our final day was spent in our private villa in Nusa Dua looking back over the last 10days and everything this breathtaking country had to offer. 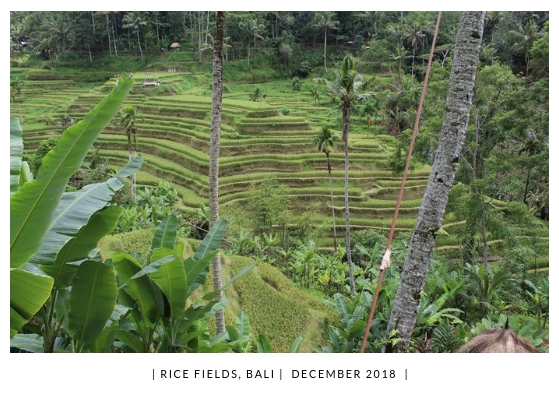 Bali has SO much to offer couples, families, friends and even those adrenaline junkies. I don’t think it will ever be possible to experience everything this Indonesian Island has to offer. One thing I know for sure is you will never feel holiday blues like it and before you have even left this slither of paradise you will be planning your return!